We are a leading Manufacturer of fixed bed flow channel, crump weir, syphon spilway, venturiflume, sluice gate and v-notch weir from Ambala, India. This apparatus consists of a Flow channel. Channel is fabricated from transparent Toughened Glass and Stainless Steel together. 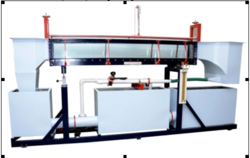 The equipment is designed to study the various phenomenon of flow with the help of various types of blocks, gates, weirs and other many types of accessories (Optional). The channel section is transparent by which user can observe the various flow patterns of fluid in the channel and photographs can be taken. These glass panels are sealed with the stainless steel bed. The channel is fabricated in pieces of 2.5 m each. These are joined with the help of flanges. This channel is floor mounted. Instrument rail is provided along the entire working length of the flume. A scale is provided along with the rail. At the inlet of the flume an inlet tank with stilling and smoothing device is provided for obtaining the excellent velocity profile in the test section. 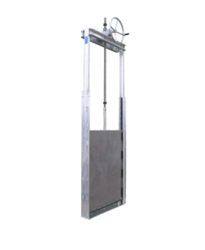 At the discharge side a gate is provided which have an adjustable height. This gate maintains the operating water levels for the flume. An arrangement has been done to calculate the slop of channel. The flow channel is self-contained re-circulating unit provided with sump tank, centrifugal pump, and control valve. 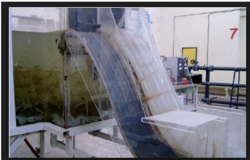 Water is circulated through the channel by centrifugal pump. The pump draws water from sump tank to inlet tank of flume and return back to sump after passing through the channel. 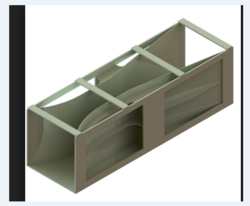 We are the Leading Manufacturer & Supplier of Crump Weir which is one of the accessories of Tilting Bed Flow Channel. Looking for “FLOW CHANNELS EQUIPMENT”?